Let us help you celebrate that special occasion with a surprisingly simple gift for your friends and family. Step 1: Enter name of the recipient. Step 3: Write your personal message. Step 4: Select your delivery method. If you choose to have the gift certificate sent via US Mail, we will include your personalized message in a lovely greeting card, and a copy of our current Collector's Edition catalog (subject to availability). Free postage for delivery via First Class Mail to US addresses. Delivery via Email is free, automatic and immediate. 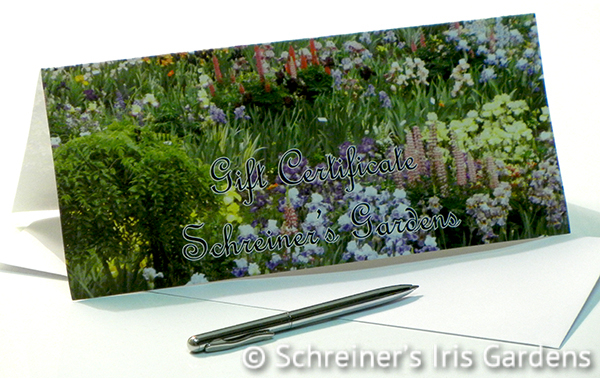 Any gift certificate you purchase, regardless of delivery method, may be redeemed online, with a mail-in order, over the phone, or in person here at our office, for any products sold by Schreiner's Iris Gardens.